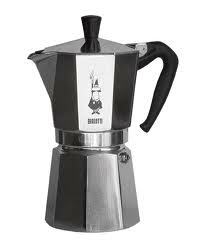 You use a stovetop Bialetti espresso maker such as the one pictured here. You in fact have three of them, each of different capacities, starting with the humble, useful one-cup maker, moving to your default size, the two cup, extending beyond that when there are portents of a long day or, perhaps even a long night. Ten minutes more or less is the time requirement. From the Bialetti filled with one of your favorite blends from Peets to the first sip is neither a long, complex process or one that necessitates your mind being off project long enough to count as a distraction. Thanks to a battery-powered frother, you are able to approximate the latte or cappuccino of your taste. Although the result is not the same as the product you are served en scene at Peet's, it is close enough to the point where you do not feel deprived, even stinted. When you leave the house, either for Peet's, Renaud's patisserie, or an increasingly favored venue, the Cafe Luna in Summerland, you are leaving to meet someone or to experience the sense of a change of scene rather than to experience the taste of acceptable coffee. When you are "in," staying at home, your relationship with coffee and coffee making is complex. Coffee often provides the missing link between a need, a decision, and actual production of text. Making coffee is a slight enough distraction to cause you to think of something else for the few moments necessary to produce "the answer," the right word or sentence, or description. A sip or two of the home brew provides just enough liberating energy to get you back on track again to the point where the next sip, when you take it, has been far enough in time from the previous as to have it tepid or worse. Only on the rarest occasion does the making and drinking of coffee distract you from writing for any serious length of time, but the same thing cannot be said in reverse. The making of sentences can and does distract you from coffee drinking, some times for long intervals, leaving you more often than you can reckon with less than warm coffee, less even than room temperature coffee. From time to time, you use the small, one-cup Bialetti maker to brew a demi-tasse in the intgerests of awakening you, keeping you awake, or symbolically energizing and invigorating you with the elan best recognized in a sentence or paragraph rather than espresso. Although you have been aware of and using espresso since your early tenties, you did not approach it as your preferred form until the late 1990s, willing to accept urn coffee, percolated coffee in restaurants, and your at-home approach, the hour-glass-shaped Chemex, which required a filter paper that was a large circle, which the preparer is to fold in quarters, then open to fit in the top cone. The strength of the subsequent coffee could be measured by the rough equivalent of a heaping teaspoon of the ground bean to a cup. The Chemex filtration system edged you toward making at least three cups at a time, possibly as many as six, which you would commit the no-no of reheating when the remnants grew tepid. You cannot recall the last time you had any relationship to speak of with urn or percolated coffee, thus your consumption remains at the equivalent in espresso algebra of four cups of urn coffee a day. You are more likely to up that to a rate of five or six cups equivalent, but only on rare occasion a smaller number. There is no ratio visible to you between the number of pages you produce and the number of cups of coffee you drink nor have you at any time factored the matter of quality of content into the relationship between coffee and writing. This is not a surprise because, although you can keep your check book balanced with some awareness of accuracy, you take your relationship with coffee as a notional matter, not by any means related directly with quantity, format, or quality. Coffee is a necessary fuel to life. The better the coffee, the more likely my brain is to fire on all 6 cylinders more appropriately. Today I'm functioning on about 4 1/2 cylinders. I should drink more coffee.